Over the years, the Chicago area has given the world some first rate power pop music in the form of bands such as Cheap Trick, Pezband, Material Issue and Shoes. If it seems like modern times haven't produced much worthy of joining that list, get acquainted with Wes Hollywood, his new band tenniscourts, and their recently released record, "Dig the New Sounds of tenniscourts." Armed with a wealth of hooks, attitude and energy, the album is a very welcome break from the hordes of overly obtuse indie rock and chamber pop acts that try hard to say a lot, but end up saying very little. 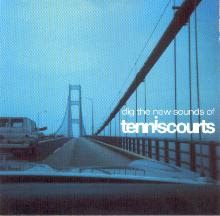 After releasing four albums over the past decade as "The Wes Hollywood Show," Hollywood decided to put together a new band, releasing the self-titled "tenniscourts" in 2007 and "Dig the New Sounds" at the end of 2008. The result is a roster of amazingly tight, masterfully written and performed pop songs that stick on the first listen and don't lose their charm. If you've ever found yourself getting tired of having to play a CD over and over before being able to get into it, tenniscourts is the band for you. From "Dig the New Sound's" first track, "Forever True," you notice that the melody is so perfect, the riffs so catchy, that you're in for something special. This is the kind of stuff that sounds like it jumped straight out of a convertible on a hot summer's day circa 1979. And that's a good thing. "Swimming Pool," which the band have released as a 7" single, is a dose of pure, revved-up new wave fun, while other highlights such as "Crystal City" and "Ordinary Life" have a definite Ray Davies or early Elvis Costello cool to them that makes them impossible to resist. Along with bassist Spencer Matern, keyboardist Chris Thomson and drummer Tom Shover, Hollywood has produced some of the finest power pop music out of Chicago - or anywhere, for that matter - in recent memory on "Dig the New Sounds." If you're a fan of hooks and melody, don't hesitate to give it a listen. Catch tenniscourts live and for free at Miska's on 2156 W. Belmont on Saturday, February 14. Check out the band's MySpace for more info and to sample tracks.